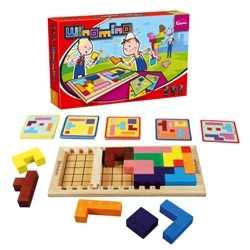 This week’s pick at a 15% discount is Winomino, a colorful geometrical puzzle game that develops fine motor, visual spatial, and problem solving skills. The challenge is to find as many patterns as you can from the puzzle pieces shown on the card. This can be a 2-player game or adapted for one player. There are various levels of difficulty so you can adjust the game to over 900 possible puzzle combinations. Save 15% on Winomino this week only by entering the Promo Code BLOGWOM at checkout. *Offer expires on October 11, 2011 at 11:59 pm EST. Not compatible with any other offer. Be sure there are no spaces after the Promo Code when you enter it at checkout. This entry was posted in Difflearn Promo Code, Pick of the Week, Products, Resources, Sale and tagged Different Roads to Learning, learning, Resources, teaching, teaching tools by Different Roads to Learning. Bookmark the permalink.